Other dosage forms: drops . : 563 р. Average price online (tube 15g) * : 563 p.
Cream white with a faint characteristic odor in the tubes of 15 or 30 grams. The consistency is usually uniform, some grit may be observed. Ingredients: Naftifine hydrochloride (1%), water, benzyl alcohol, isopropyl myristate, sodium hydroxide, polysorbate 60, sorbitan stearate, stearyl alcohol, cetyl alcohol, cetyl palmitate. Wash skin with soap and dry well before applying. 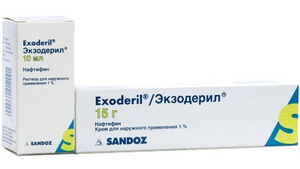 Exoderil is applied once a day, in a thin even layer on and around the affected area. It is enough to apply the cream on a visible unhealthy area and areas within 1 cm around it. Symptoms disappear quickly, because contains anti-inflammatory substances. But the treatment must be completed completely, otherwise the disease will return. If no improvement is observed, be sure to consult a doctor. 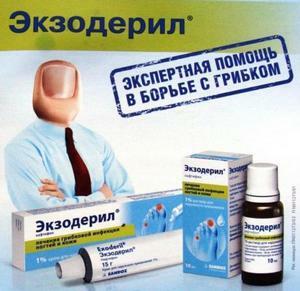 For nail treatment it is recommended to use Exoderil in the form of drops . The cream can also be used to treat nails, but then it should be applied twice a day until a healthy nail grows. Since safety for pregnant women and babies has not been investigated - the drug is contraindicated for expectant mothers and nursing mothers. Few studies on the effects on children are therefore not recommended for children. Local reactions are possible, although unlikely: dryness, burning, redness. These symptoms are not dangerous and disappear after drug withdrawal. 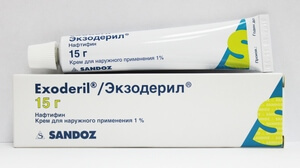 Exoderil has antifungal and antibacterial effects. Naftifine hydrochloride inhibits the synthesis of substances necessary for the growth of fungi, thereby causing their death. Active against dermatophytes, yeast and mold fungi. Do not allow papadaniya in the eye. Sold without a prescription. Keep out of reach of children at temperature not exceeding 30 ° C. Shelf life - 5 years from the date of production.